COACHES: Please email additions or corrections to Peggy McCoy (major meets only). Ashley Bailey and Kieran Tuntivate named the season's MVPs. Charter's Kieran Tuntivate Places 2nd in the Elite Mile, Improving His Mile Mark - 4:11.58! Middletown's Ashley Bailey Bests Her Own State Record in the Pole Vault - 12' 3"! Kieran Tuntivate holds off Stephen Garrett to win the 3200m. 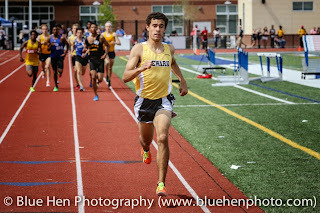 Charter's Kieran Tuntivate ran a stellar distance double winning both the 1600m (4:14.49) and the 3200m (9:09.95). 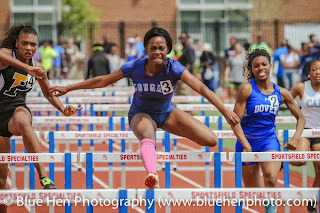 Dover's Mykele Young-Sanders came away with both hurdle championships - 110mH/14.22 and 300mH/37.98. 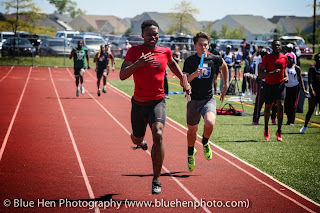 The boys from William Penn (Kyler Murray, Mike Mills, Kamau Floyd, & Chiason Tenkeang) continued to dominate the sprint relays - 4 x 100m/72.78 and 4 x 200m/1:27.84. Tenkeang & Floyd were victorious in the 100m and 200m respectively. Left photo: Padua's Christina Allen wins the Long Jump in 17-10.50. Right photo: DMA's Nicole Harris approaching the finish line to win the 800m. Newark's Jarod Wilson showing his dominance in the 800m. Appoquinimink's Larry Perez (3) upsets Glasgow's Jay Whalen (4). Dover/Lake Forest Boys, Padua/Hodgson Girls are Team Winners at the DIAA State Championships in Dover! Lydia Olivere and Rachel Beston battle in the DI 3200m. Eamon McCoy finishing as the winner in the DII 3200m. Kyler Murray is the winner in the DI Long Jump. Garth Warner clears 6' 8" and wins the DI High Jump. Delcastle's Sherita Lowman is victorious in the DI 100mH. Najiya Cornish wins DII 100m to beat duo from Hodgson. 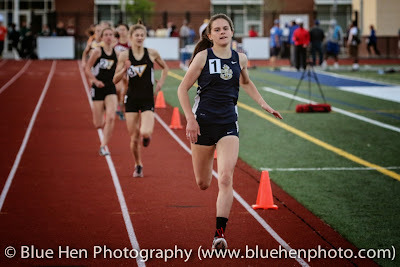 Colleen Carney sets the pace in the 1600m, after also winning the 3200m on Friday. 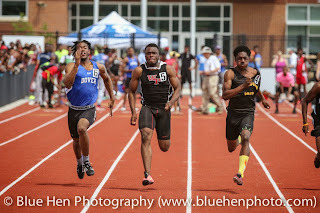 Left photo: Chiason Tenkeang (5) holds off Ja'Saan Cunningham (4) and Darius Taylor (6) in the DI 100m. Right photo: Jarod Wilson with a commanding lead heading into the bell lap of the DI 800m. Mount Pleasant/Padua are County Champions! 5 guys race under the 4:15 mark in the 1600m! From Left: Eamon McCoy (3rd place), Jarod Wilson (2nd place), Ben Boswell (4th place), Andrew Hally (5th place) and the winner, Kieran Tuntivate, running a state record time of 4:11.71. 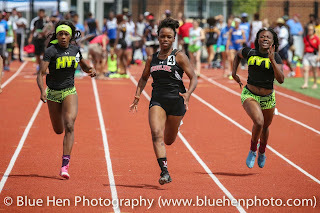 Maiya Dendy, Daija Lampkin, and Maysha Foster down the home stretch in the 200m. Nick Robinson (Tatnall) Wins the Shot. Concord's Garth Warner Clears the High Jump Bar. Mount Pleasant's team victory came behind just two winners, Anthony Mitchell (110mH/14.90) and Malachi Davis (TJ/44' 9"). Scoring 74 points, they held off William Penn (63) and Salesianum (59). 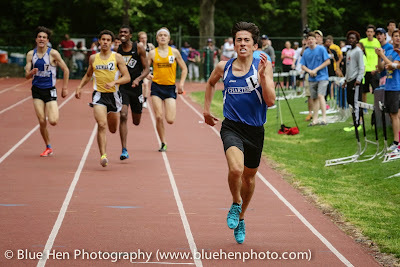 Kieran Tuntivate came away with a State Record in the 1600m, winning the race in 4:11.71, in the race of the day. 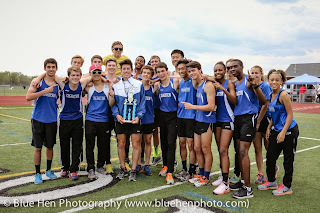 Five boys, including Tuntivate, broke 4:15 in this epic event: Jarod Wilson (Newark), 4:13.93/#5 All Time; Eamon McCoy (Brandywine), 4:14.23/#6 All Time; Ben Boswell (Tatnall), 4:14.33/ties #7 All Time, and Andrew Hally(Salesianum), 4:14.84/#10 All Time. 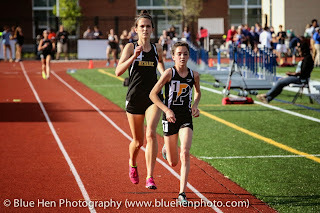 Hally, just a junior, won the 3200m Friday evening running the 3rd fastest time ever at the county meet in 9:20.91. If there was an MVP of the meet, it would be hard to not recognize Newark's Jarod Wilson. Aside from his school-record 1600m runner-up competition, he anchored his team's winning 4 x 800m in 1:49.7 (#6 All Time along with teammates Daniel Mwaniki/1:59.8, Brandon Smith/2:03.1, Gregory Biddle/1:59.5) Jarod finished the meet anchoring the winning 4 x 400m in 48.3! 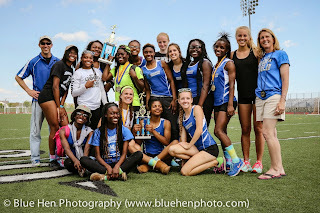 William Penn won both the sprint relays. Kyler Murray, Chiason Tenkeang, Kamau Floyd, and Mike Mills ran the #2 All Time 4 x 200m in 1:27.34 and the #3 All Time and New Castle County meet record 4 x 100m in 42.08. Domingo Johnson, of Howard Tech, won the 300m Hurdles in 37.97 - #9 All Time. 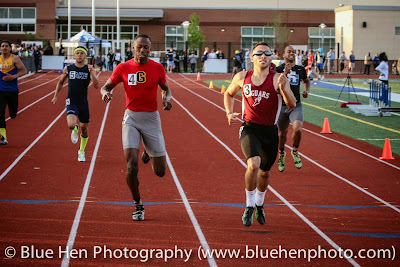 Jay Whalen, of Glasgow, was the boys' meet's only double winner - taking the 200m (21.92) and 400m (48.67). The girls from Padua dominated, leaving just two track events without a Panda on top (100m/100mH)! This was the 4th straight New Castle County championship for the Pandas. Padua senior Maiya Dendy won the 200m (24.44) and 400m (56.85). She set the New Castle meet record in the 100m preliminaries in 11.83, before being disqualified in the semi's for a false start. Najiya Cornish, a freshman from Ursuline, took the 100m title in 11.89, #3 All Time and a new Freshman class record (held by Dendy)! 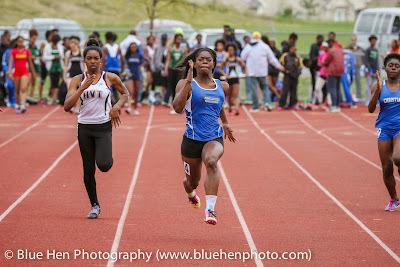 Daija Lampkin (Middletown), was runner-up in the both the 100m and 200m. Her 200m time of 24.55 is #8 on the All Time list. 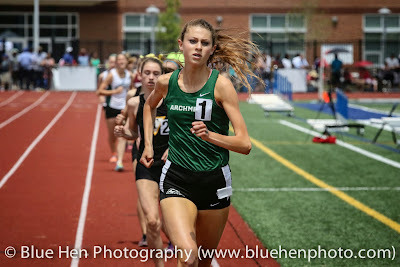 Archmere's Colleen Carney ran away with the 3200m in 10:45.24, shy of her personal best of 10:39.06 (#7 All Time) run earlier in the month at the Henderson Invitational. Middletown's Daija Lampkin Leads All Runners and her Team as a Triple Winner! Jarod Wilson gets the baton from teammate Greg Biddle to anchor the 4 x 800m in 1:50.5! 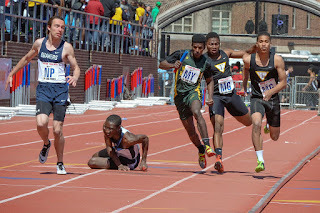 Wm Penn's Mike Mills edges Austyn Warren anchoring the #2 All Time 4 x 200m relay! Despite Colder Temperatures, Delaware Athletes Left a Mark at the Relays! - Padua (Emily Paolucci/3:44.40, Maiya Dendy/58.22, Erin Spadaccini/2:19.56, and Lydia Olivere/5:00.83) placed 4th in the Championship of America Distance Medley Relay, running 12:03.00 - #3 All Time! - Ashley Bailey, of Middletown, placed 5th in the Pole Vault (11-11.75). - Padua girls placed 6th in both the Tri-State Championship 4 x 100m (Christina Allen, Darby Deutsch, Jordan Sobelesky, and Maiya Dendy) and the Philadelphia Area 4 x 400m (Jill Ciritella/1:01.65, Taliah Cintron/57.84, Erin Spadaccini/59.65, and Maiya Dendy/56.96) following their win in the 4 x 400m Northern Delaware section earlier in the meet. 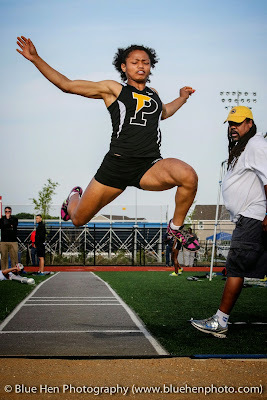 - Padua's Christina Allen placed 16th in the Long Jump - 17' 3.25". Kieran Tuntivate in the HS Boys Mile. Tatnall Passing in Traffic. - Stefano Pineda (Charter) placed 3rd in the Pole Vault with 15' 5". 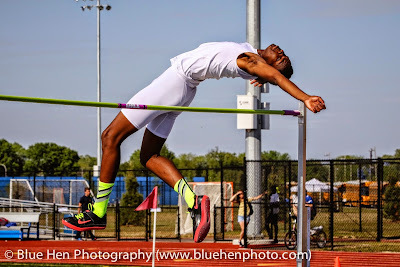 Sam Young (Cape Henlopen) placed 7th with 14' 3.25", #9 All Time. 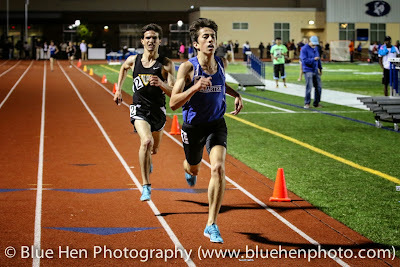 - Charter's Kieran Tuntivate placed 5th in the Boys' Mile running 4:12.58, improving his #1 All Time Mile/1600m. Newark's Jarod Wilson was 14th in 4:20.45. - Garth Warner, of Concord, tied for 4th place in the High Jump (6' 7.75"). 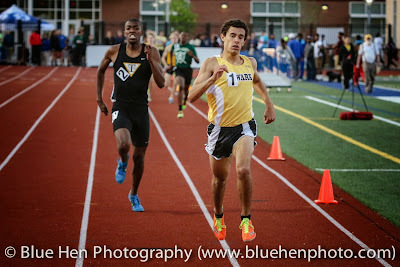 - Charter's Kevin Murray was 10th in the 3000m Friday night running 8:41.08. - AI duPont's Elijah Agwu placed 10th in the Discus - 164' 6". Tatnall's Nick Robinson was 14th at 159' 1". - The boys from William Penn (Kyler Murray/51.61, Chiason Tenkeang/50.55, Adrian Spaulding/52.17, and Kamau Floyd/50.47) took the Northern Delaware section of the 4 x 400m in 3:24.78. - William Penn boys (Murray, Tenkeang, Floyd, and Michael Mills) were also the fastest time of the meet in the 4 x 100m - 43.17. - St. Georges ran the fastest time of the meet in the 4 x 400m (Taronn Selby/48.68, Keyjuan Selby/49.01, Austyn Warren/51.84 and Zack Bowe/50.00) running 3:19.52 - #8 All Time! - Mykele Young-Sanders placed 20th in the 400m hurdles in 57.01. Mykele Young-Sanders ran 53.96 to win 400m hurdle event - #3 All Time! Tatnall Trio, Ben Boswell, Nick Robinson, and Caroline FoleyRecord Nice Doubles! 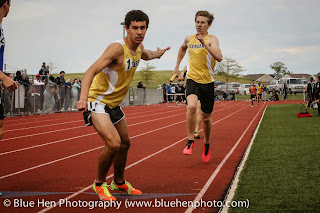 In a race where eight guys broke the 2 minute mark, Boswell, a senior took the 800m title in 1:54.58, #10 All Time! 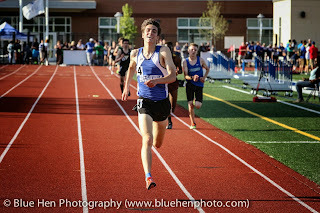 Earlier he placed 2nd in the 1600m running 4:17.39. 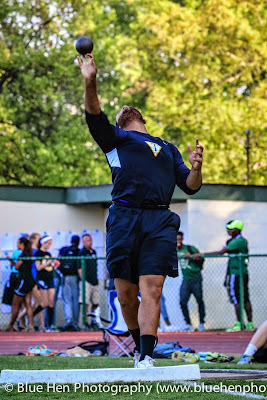 In the throws, Robinson, a senior, took the title in the Discus - 152' 03" - and placed 2nd in the Shot - 49' 11.25". Foley, a sophomore, placed 2nd in a close finish in 5:04.77, just over a tenth of a second behind the winner from Germantown Academy (Goldstein/5:04.69). She came back and finished 6th in the 800m (2:20.17) in a race that was won in 2:07.56 (Walker/Germantown Friends). In what was formerly a night of relays, pairing individual events with not-often-contested relays made for a winning combination. Padua and AI duPont were team champions. 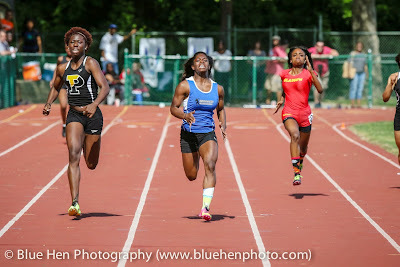 Ursuline freshman Najiya Cornish was the short sprint champion winning the 100m in 12.21 followed by a championship in the 200m - 25.18. Padua's Taliah Cintron took both hurdle titles - 100mH/15.81 and 300mH/47.29. Kelly Muschiatti (Padua) won both the High Jump (4' 10") and Pole Vault (9' 6"). 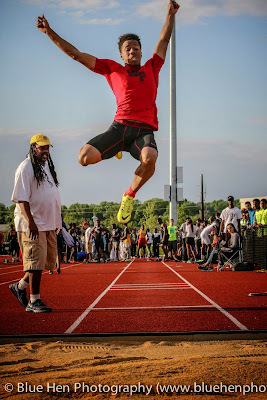 AI duPont's Elijah Agwu continued to prove his dominance in the field, winning the Long Jump/21' .25", Triple Jump/43' 5", and Discus/153' 2"! Hodgson's Ray Jones Wins Three Events North of the Border! Jones took the 200m (22.91) and the Long Jump (22-09.25) and was on the winning 4 x 100m Relay team (44.19)! Charter Boys Post Elite Perfomances on the West Coast! Stefano Pineda Vaults 15' 7", #2 All Time, to place second in the Pole Vault! Kieran Tuntivate improved his #3 All Time mark in the 3200m to 9:06.30! Kevin Murray set a Junior Class State Record running the #4 All Time best 3200m in 9:07.01! McCoy took the 1600m in 4:26.84 and the 800m in 2:00.25. Padua got a boost from wins in ten events! Polytech's Amber Lust was a double winner (100mH/15.22, 400m/59.57) and was 2nd in the 200m and 3rd in the 300mH! Lake Forest boys dominated the sprint relays winning the 4 x 100m (44.98), the 4 x 200m (1:32.57) and the 4 x 400m (3:29.89). The Spartans also got big points from hurdler Henry Miller, who won both hurdle events - 110mH/15.46 and 300mH/40.91. 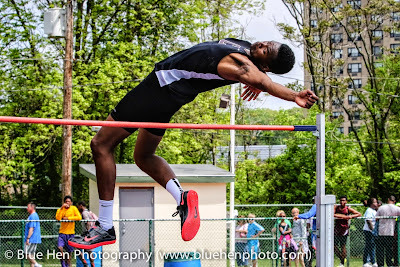 AI duPont senior Elijah Agwu continued to come up big in the Discus - winning in 173' 6" - with wins also in the High Jump/6' 5" and the Triple Jump/43' 9.75"! AI du Pont's Elijah Agwu Has a Big Day! Agwu, a senior, was a triple winner in the field - High Jump, 6' 4", Triple Jump, 46' 3.5", and #10 All Time performance in the Discus, 173' 2"!! Jarod Wilson Runs 4:17.02 Mile to Place 4th! The senior from Newark posted the #5 All Time performance racing against a strong field in this early season test. Kelly Muschiatti (Padua), Pole Vault - 9' 6". Padua Girls/Mt. Pleasant Boys Win Early Season Championships. Double winners were Middletown's Daija Lampkin in the 100m/200m, and AI duPont's Elijah Agwu in the Triple Jump/Discus. Padua's Kelly Muschiatti won the Pole Vault with 11' 6", tying #2 All Time! Charter's Kevin Murray runs 9:18.07 in Boys' 3200m for 7th place - #11 All Time! Teammate Kieran Tuntivate also placed 7th in the Boys' Mile - 4:21.63. Smyrna Girls/AI Boys Take the Team Championship.